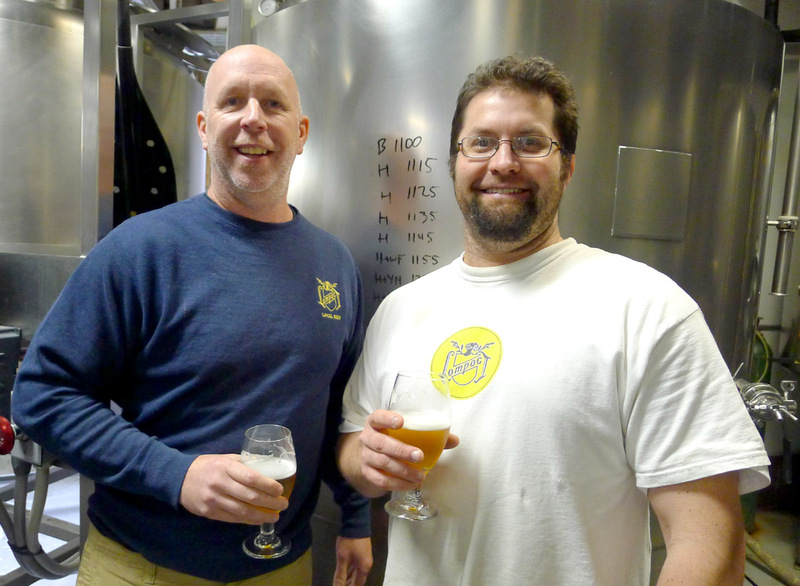 Lompoc Brewing is turning 20. In case you aren't aware, Lompoc was one of the second wave of craft breweries that launched here in the mid-1990s. While some are no longer around, Lompoc has rolled with the punches and continues to carve out a successful path. 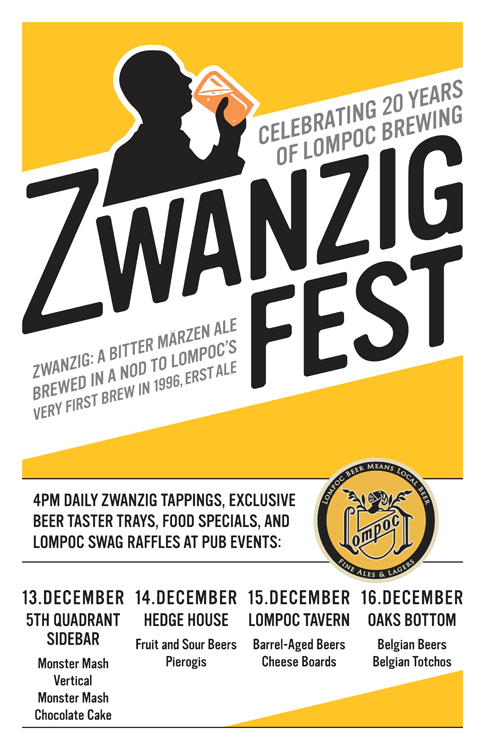 They'll be celebrating two decades in December with Zwanzig Fest, a week-long lineup of special events at Lompoc’s five pubs (Zwanzig means 20 in German). 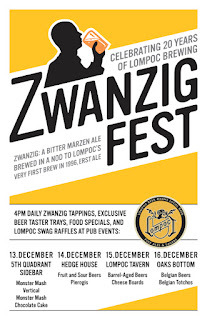 Several local brewers and writers, including yours truly, helped brew their anniversary beer, Zwanzig, a bitter Märzen ale. Purests know authentic Märzen is a lager, not an ale. Never mind. This particular beer is a tip of the hat to Lompoc's first beer, Erst Ale. It will be pale orange in color with a mildly malty body. Eight hop additions ought to give it plenty of aroma, flavor and bitterness. If craft beer newbies aren't particularly familiar with Lompoc, there's a reason. Which is that, despite operating out of several locations, they have been somewhat obscured by Portland's brewery explosion. When owner Jerry Fechter opened New Old Lompoc in late 1996, there were only a handful of competing breweries. The story is fairly well-known and is briefly retold in Portland Beer. Fechter had worked at Old Lompoc Brewing in Northwest Portland for several years. The beers were decent, but he felt the food should be better. The lease was always an issue. When the owners negotiated a three-year renewal, Fechter saw an opening and inquired about buying the business during a round of golf. Soon enough, the owners came back with a number. It was a number Fechter thought he could manage. But as he looked at what needed to be done to move in the direction he wanted, it became apparent that an investor would be needed. Enter legendary publican, Don Younger. "I had enjoyed beers with Don," Fechter recalls, "but I didn't really know him. A guy at Belmont Station, then next to the Horse Brass on Southeast Belmont, told me Don might be interested in my project. He spoke to Don. The next day, my phone rang. It was Younger." The call led to a couple months of drinking and discussion, trying to figure out how a partnership might work. Eventually, they hammered out an agreement. Younger became a partner in the business, but stayed mostly in the background while Fechter managed day-to-day operations. "We knew the food needed to be better," Fechter recalls. "That meant a hood and an improved kitchen. We also realized there was unutilized space in back where we could put a patio. So we built a nice patio, which was busy and a hidden gem in Northwest Portland for many years. By the time Younger passed away in 2011, he and Fechter had opened additional locations...the Fifth Quadrant, Sidebar and Hedge House. Fechter had also partnered with publican Jim Parker on Oaks Bottom Public House. Today, Fechter operates those locations, as well as Lompoc Tavern, which replaced the original Lompoc pub on Northwest 23rd after it was demolished. The pub and beer business is a more challenging enterprise these days. You can't get by with a few standard beers and an occasional seasonal. You need seasonals and specialty beers all the time to keep up with all the new places coming online. Head brewer Bryan Keilty is constantly working to develop unique recipes and approaches. "We know relevance is a challenge with so many new breweries opening," Keilty says. "The attraction of new places isn't new and it doesn't bother us. It just means we need to stay on top of our menu and work to build and maintain a solid beer lineup. That's our focus." Packaged product is another matter. Lompoc has a handful of bottled beers in distribution via Maletis Beverage. That was strictly 22 oz bombers until last summer, when they launched C-Note and Pampelmousse IPA in 12 oz six-packs. Cans of something may be on the way. "The strategy with bottles is marketing, getting our name in front of consumers," Fechter says. "That's the main reason we do packaged product. When we saw bomber sales slowing, we launched six-packs. The next step might be cans, but distribution will never be a big part of what we do." Fechter's thinking is well-informed. He knows the best margin on his beer is in his pubs. Why play the distribution game where the profit per bottle, gallon or keg is small? With retail space getting crowded, some regional and national craft brands are getting squeezed. Meanwhile, a lot of smaller breweries are doing fine. Small and local is a good place to be. After 20 years in an increasingly competitive business, it's clear enough that Fechter and his team have figured out how to successfully navigate changing times. Congrats on the milestone, folks. See you at Zwanzig Fest.